Historic Charlton Park: Village, Museum and Recreation Area has been a fixture in Barry County since 1936, and is often referred to as the "jewel of Barry County." Situated on 310 acres along the Thornapple Lake, Historic Charlton Park offers many options for the outdoor enthusiast including hiking, boating, swimming and fishing. If you are looking for something educational for your children or students, visit our turn-of-the-century Historic Village and Museum. The self-guided format gives you a chance to explore at your leisure and more formal education programs are also available. 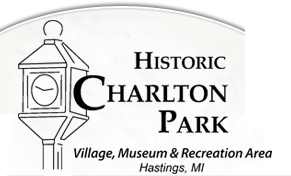 If you are looking for a weekend adventure, consider attending a special events at Historic Charlton Park. 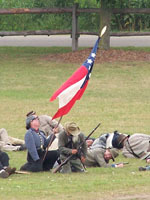 Thirteen events ranging from yard sales to a Civil War Muster are held almost every weekend during the summer. If you are looking for a unique place to get married or hold a family gathering explore Charlton Park's facilities. We offer many options to provide you with a memorable venue. Come visit Historic Charlton Park. We offer opportunities to learn, to relax, to have fun: something for everyone!